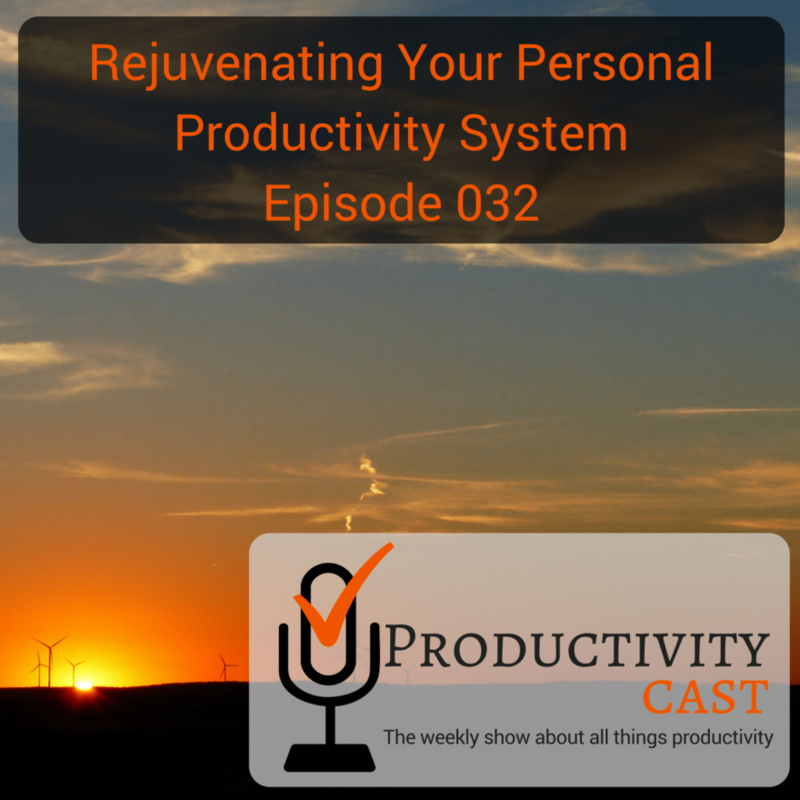 What is rejuvenating, re-charging, and rebooting your personal productivity system? And, what reasons might lead you to need a reboot of your personal productivity system? What are existing methods you know of or have tried for rejuvenating your productivity? What are some hurdles to be mindful of when doing a rejuvenation/recharge/reboot of your system(s)? The ProductivityCast team discusses how they view and approach productivity rejuvenation and overcome obstacles to having a well-maintained personal productivity system. Enjoy! Give us feedback! And, thanks for listening! Are you ready to manage your work and personal world better to live a fulfilling, productive life? Then you’ve come to the right place productivity cast, the weekly show about all things productivity, here are your hosts, Tracy Smith, and a goose open out with Francis Wade and our gal wicks. Hello, and welcome back everybody to Episode and of productivity cast, the weekly show about all things personal productivity, I’m recently Smith and I’m joined here with my co host Augusta burnout. And Francis weight is joining us today we are going to be talking about the concept of rejuvenating, recharging. rebooting the productivity system. And so what we’re going to do today is really talk about it in three parts. One is what and how do we define the concept of rejuvenating, recharging. rebooting what have you and what might lead a person to go ahead and do that, why you might want to refresh your productivity system. And there’s a good reason why you might decide that you know, your system, something about it isn’t quite right. And this is an opportunity to kick the tires and make the rest of your year really be on solid infrastructure. So we’re going to talk about that, then we’re going to segue into what are some existing methodologies that we either know of, or have tried in rejuvenating a system. And then finally, talking about some of the hurdles, one might come into contact with and experience as you try to rejuvenate your system. And therefore, hopefully, we’ll be able to guide you around some of those things circumnavigate them, so that you don’t experience them as you try to rejuvenate if you do attempt such process. So let’s start off with what is the concept of recharging. rebooting? How do you define that idea, and I’m going to throw this out to you a Cousteau. Thank you. Well, you know, the interesting thing was printed, juvenile eating is we tend to think that because we found a solution or on a certain instant, our system that can work for us that working things are going to permanently continue on that way. And the system that we have will work forever. The reality is that for a system to work, there is a lot of variables that play a factor into keeping this things moving, you know, being the obvious ones are volume, but that there are others like how you are feeling where you are, how much traveling, have you doing, how are yous are you to travel, and how much things are changing on your surroundings that are also going to affect how effective that system is. And once in a while, you need to come and clean the house, you know, clean rejuvenate is no other than clean all those mushy things that make your system less effective. There are many ideas that you can do. And later on, I will share one of those that I do often when I work with people I recommend because it helps revenue germinating your system. I need help getting some of that has come out of it out of there. I have a radical view, I think, which is that there’s only a small percentage of people who care about rejuvenating maybe a two to i of the population. If that many who are sort of your productivity geeks like we are. But I think most people aren’t interested in rejuvenation, they kind of go along and go along, they noticed some unwanted symptoms. And then they ignore them. For the most part, they go along, go along and go along and they it gets worse. And they ignore it some more. And they go along, go along. And eventually, they only decide to make changes when they problem becomes a cute arose when they start suffering in a major way. And they can’t possibly bear it anymore. So I was most, years old. And I was next door playing with some friends. You know, having a good time playing football, soccer, I totally forgot that it was time to leave to go to a big event to see my father receive the biggest award. He had ever gotten in his life. Up to that point. And that time I got home, I was faced with a locked up house car was gone. No sign of life. So I think I was young enough to decide. I need to do something differently. And I think that’s what people don’t do anything with their productivity system. Because it. It’s too hard to, to change. There’s too many choices. Too many know, we have too many options. The only do so when there’s some critical event or some long term suffering becomes sort of acute, I think most people don’t don’t want to do anything. I have the fortune stash misfortune of teaching productivity programs to folks here in the in the Caribbean, Jamaica, we’re not exactly known for the heights of productivity, put it mildly. see different patterns, you know, observations, and now you are too close, it’s hard to see where the problem is. And that’s what I see with a lot of the people I work there is two elements, how they keep the things that are relevant and hot. And those usually are not a big deal because they are hot there, you know, they need to get done, but how they do the rest, you know, and I said at the beginning of the of today record, in that I was going to share something that I tend to share with these people often and is every at least once a month, we take an afternoon on a usually on a Friday, and then is let’s do all stuff out of the list. Forget about priority, forget about this is urgent, you are going to plan for this Friday afternoon, the only thing you’re going to do is low priority things on your system. And what that produce is a really sense, I’m for divination, because you forget that even that your conscious mind is not thinking about that dumb thing that you put in the list, your unconscious mind thing that you should have done that dumb thing for the last three months every day. So what you accomplish having that afternoon of dumb things is that you clean up a bunch of space, not only in your system, but in your mind of things that they’re never going to get done. Because they are not that relevant. And that important than in comparison with everything else. But that you have that on your system nagging you. So for example, hey, I have some boxes in the garage that I need to get rid of them. Fine. How, how long that will take you. It will will take me five minutes. How long has been how long this thing has been on your list or seven months, okay, and every hear myself included, have those items on the list. Okay, the difference is, what is your strategy for that is what Ray was mentioned early. I have a system for reading, I have a system for groceries. I have a system for Well, you also need to add a system to rejuvenate your system, weekly review, it’s an element I longer weekly review, it’s a better insight, it’s it’s an additional good element. But also you need a system to get rid of the of although things that you are put there that has are never going to make to the top of the list. Okay. But for some reason, they were important enough for you to write it down. So you need to make the decision of No, I’m never going to get those boxes out of the garage, and then cross it out or find a way to put some time into the system to get those things out. So your system can and get some flow, again, and allows you to keep moving at a higher speed. over many, many years. But it’s basically a reflection process and then a planning process or sort of a you what I would like to kind of process and then an action plan that I produce based on that usually at the end of the year, usually by the end of my year, which my productivity year ends on October, make. So I spend the month of October, reflecting planning and then creating an action plan based on that. So for me, as I said, at the top, my whole rejuvenation process is truly incremental, it builds on itself and it gives me multiple opportunities to fail, right. And because I’ve created failsafe systems in my year, naturally, every time I come across a monthly a quarterly and then my annual review I have placed different questions at those times than my normal weekly reviews, right, because my weekly reviews are going to still be in cooperated within those. Those are larger reviews. But for my annual process, the monthly and the quarterly reviews so concluded include a weekly review, but now they have more questions on top of them that I’ve decided are necessary for me to look back on the operations of my systems, what’s working, what’s not working, and how do I go ahead and do that better. And then I can look at that across many different areas of my life. So it works really well for me. And I recommend that if you again, if you’re highly, you know, structured and you really like the concept of the weekly review, then incorporating this idea that every fourth review is a monthly review every them reviews a quarterly review and just repeating that methodology gives you the ability to create a set of questions, a set of things that you need to review as well, like the low priority items that Augusta was talking about and saying, Okay, well, what’s been hanging around too long, let me give some energy and time to that because I clearly haven’t clarified I clearly haven’t decided I’m not doing it, I have I’ve decided I’m doing it. But there’s some emotional component that is holding me back from doing it. And you know, just Asterix there. That’s usually the thing that holds me back from getting things done is that emotional component where something in my world is, you know, under the surface. And, you know, I’m, I’m not emotionally aware of it. And therefore, it just sits on my someday maybe list and keeps festering there. And that requires a little bit deeper looking, you know, it’s, oh, well, you know, maybe I just, I’m fearful of this or I don’t want to do this project with this person or whatever it is. And so then stagnates so you need to give some more energy to that in order to be able to get it off your plate potentially to say, listen, oh, this is not going to get done. Let me put it in the trash. system outside of my weekly review. you know, my, my whole thought behind it was, okay, well, I need to slice and dice my world in a way that allows me to be able to manage projects better, but they can’t sit in the same space that I thought horizon to fit for me, because horizon. Two is purely for maintenance, in my mind, you know, after having read, making it all work, and I and I was comfortable with that. But the idea of a life category is much different, you know, it’s, it’s the, it’s the pie of your attention, it’s how much attention. Can you can you put on any one thing, and what we’ve learned is that humans can’t put their attention on that many things, they can’t keep that in their, their, their focus. So how do we do that? Well, we break our life up into these life categories. And we focus on a particular life category at a time. And by doing that, we can make stronger inroads into our productivity, then, if we focused on all of those pieces at a time. And there’s a base level, right, there’s a certain set standard, right? Like, every day, I need to brush my teeth, wash my face, take a shower dress, and what have you. But the reality is, is that once those base levels are met, then you need to set that aside. And, and, and if you’re focused on, say, You’re, you’re one of your life categories, like you’re, you know, so you decide work is a life category and you’re trying to make some strong inroad, then you need to, you need to meet the minimum levels on all of the parts of that pie, if you think about your life categories, in terms of slices of pie, and then go deep into the work slice, right? And, and that’s what allows you to be able to do that. And so this whole rejuvenation process is actually what allows me to be able to do that. you know, that question are sort of stuck with the two of us. If you ask it back and forth, because a lot of the principles that we talked about the three of us or anybody who’s interested in productivity are a little bit high minded in the sense that they’re her conceptual, but I think when they convert into the kind of questions you’re talking about the pointy clan of questions, they have a whole nother effect on behavior. And if we can ask herself, the right question it it Trumps all the categories, because I also used to use the categories as well, I also had a system of different domains and, and looking over all the domains, but couldn’t get them down to the handful of questions I needed to ask on a regular basis at the in the right sequence at the right times. So, it strikes me that, for example, for this couple that asks, ask each other. This one question each day. There’s also as you’re seeing, there’s a weekly question, monthly questions, quarterly questions and annual questions. And if all you do is ask yourself these questions, they take you a very, very, very, very long way. And there’s a question I started asking myself about a year ago. And it led me to write an article that I did in the show notes about evergreen choosing your next your next task management system. And it had to do with this, that when people go looking to make a change or some kind of rejuvenation, and they read stuff on the internet, they there’s a school of thought that says, all you need to do is change your behavior, your habits, and your practices. However, most of the articles that have to do with improvement, no focus on apps or technologies or new software. And I sort of came to the conclusion that the question that we need to ask ourselves has something to do with the combination of behavior app and device that today, things have changed from where they were humans years ago. And I just actually I’m publishing a new version of my book, The New Edition. And I’ve had to weave this idea in because it wasn’t there. Five years ago, I only focused on behavior. And I kind of said, Yeah, yeah, the tools are kind of important. But, you know, don’t worry about it too much. I had to rewrite the book, basically, starting with the idea that in all, you have to choose a combination. When you rejuvenate your system, you need to think in at least these three dimensions. At the same time, and you need to ask a question like, what’s the next best combination for me to adopt for myself? That’s very different than what does this guru, say, in terms of the behaviors? Or what’s the latest app that I should be using? Which is a lot of questions that people are asking. No, or what’s the fanciest later. Tell me the, best? And I’ll pick one. People are asking a lot of questions like the ones I just said, but to get it down to what’s the single combination. I need to adapt next or myself so that I can experience this rejuvenation is an example of a question that I want to have been sharing. But I think it comes down to that quality of question, a simple question that leads you to answer sort of the right concern. the tools and things has evolved, but how the people who use that has evolved. that’s a brilliant insight on that. He just said it. You know, and I an iPhone is an entertainment device. The Palm Pilot was a productivity device. all I’m gonna say is that if there are any young people who are listening to this and are about to graduate, we have a new generation starting to graduate in June of this year. just FYI, I agree. But the problem is, the problem is, if you go to generate older generations, we have figured it out and struggle, how to make that iPhone or Android somehow a productivity device. they don’t have really don’t, most of them don’t have those basics. And they struggle with that note, because they don’t have the capabilities. No, they’re brilliant people in when you hear about all the problems with millennials know Millennials are a lot of them are brilliant, but they lack some of the basic tools. Because part of the premise is we are not going to use anything all people is using, you know, one of the biggest challenge. Facebook is having right now on. Part of the reason they bought Instagram is they weren’t starting to lose, you know, they were gaining like any insane pace older people. But at that insane pace, they were losing younger people. Because now the younger people don’t want to be where they’re all people is. And it’s fine. Except that we are doing that what they are accomplishing is they are stopping to use the tools that work for the older generations. And the tools that most likely will work for them. If they look at them. whole client who was the CEO small company and he hate the weekly review. So we were working together and film. Oh, that’s a waste of time and say, Why? Well, when you do your with your review, so Well, I do it on Fridays. But then by Monday I have all these meetings. And by Tuesday’s useless unless I understand. So how about you change this. What you mean? I said, Well, why would you don’t do your weekly review Tuesday after you meet with all your key employees. So what he used to do is he did the weekly review and Friday came Monday morning have made in his all his key people. And then by Tuesday, of course, this system was completely obsolete, because he had a bunch of stuff that he did not have time to think. So we changed the meetings whiskey people, actually, to Friday, and then Monday morning, he now goes out of the office, because I recommend you should do weekly review out of your environment. So he is stopping a Starbucks before he goes to his office expanded, drinking the GFI thinking this connected internet down, do his weekly review, and then gets to the office. And that changed the whole system. Though he did not need a new system, he did not need a new piece of software, he did not need anything other than change the order in which the input was coming. Because the problem is, he was cleaning the house, okay, making the house pristine and beautiful. And then the next business day, everybody was dumping an incredible amount of things into his system that make his system look as he has never clean up the system. And it was really frustrating for him. So look into how you’re doing things or hire somebody who can look at if you are too into the trees that happened, sometimes, you know, one of the things that I do a lot is work with other people that can look into my system that can look into how I do things. Why, because I’m too close to it, I don’t see the problems and I don’t see the things I do wrong. Because it’s the way I have done it, that’s the way to need to be done. So look into that get hire somebody get friend doesn’t matter. But before you think that you need to revamp and redo everything that moved to a new piece of software, to a new piece of hardware, pay attention, one on how is your input versus your clean and organizing faces happening. So you can put them in any stage that is more useful for you. host racing is Smith, and goosed open out with Francis Wade and art Gail licks.